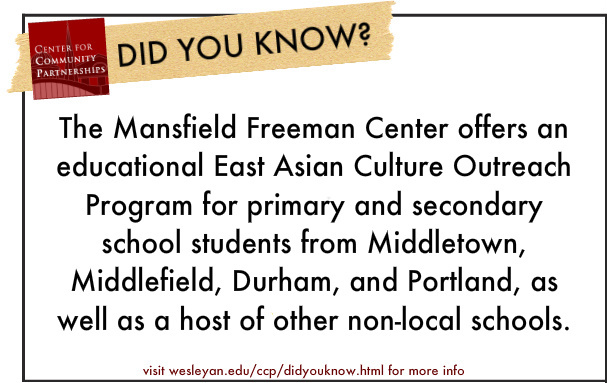 This week’s fact highlights the Mansfield Freeman Center, which houses Wesleyan’s East Asian Studies Department. The Mansfield Freeman Center website offers more information on their partnerships with the greater Middletown community: “[The Center] offers a variety of special programs and resources focusing on East Asia. Although these programs are offered primarily as a service to students and other members of the immediate Wesleyan community, the FEAS’s doors are in fact open to all members of the wider Middletown community. The FEAS’s more publicly-oriented programs–including the colloquium series and art exhibitions–attract visitors from all over the state, as does the FEAS’s Japanese-style garden, Shoyoan Teien. The FEAS also runs a unique outreach program, which enables students from local schools to learn about East Asian culture through hands-on activity workshops, exploring such subjects as music, writing, and calligraphy, food and cooking, martial arts, and the Japanese tea ceremony.” The Center’s outreach program, specifically, includes hundreds of students every year; it is so popular that schools are chosen in a lottery to participate.